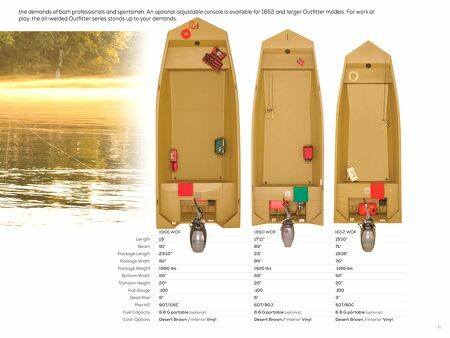 g3boats.com When your adventures demand additional cargo space, or an open floor plan for dealer-installed options, like an adjustable console or box pedestal seats, the G3 Outfitter jons are there to meet your needs. Used extensively in rugged backcountry environments from Alaska to Texas the Outfitter series by G3 offers a workhorse platform that stands up to STANDARD PACKAGE Welded, .100 gauge hull | Painted | Galvanized tubular steel Trail Guard® trailer with locking detachable tongue, space saving and security | 13" radial tires No exposed ribs or floor gaps with fitted side sheets. F60 . F70 . F75 . F90 . F115C (1966 WOF) F40 . F50 . F60 . F90C (1980 WOF) F25 . F30 . F40 . F50 . 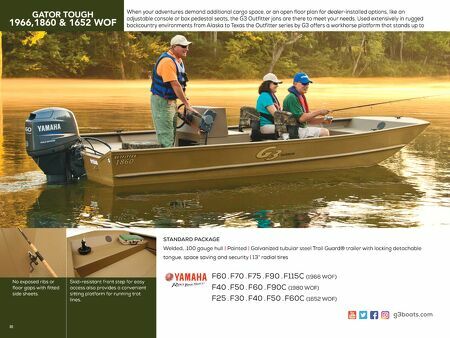 F60C (1652 WOF) 80 Skid-resistant front step for easy access also provides a convenient sitting platform for running trot lines.